SIR EDMUND DENNY, Knight, one of the barons of the court of exchequer in England at the beginning of the 16th century, was great-grandson of John Denny, who fell in the French wars of HENRY V, and was interred at St Denys. Sir Edmund died in 1520, and there is a monument to his memory in the church of St Benet Paul's Wharf, London. By his last will, he directed his body to be laid in that church, and that twenty trentals of masses should be said for his soul, and for the souls of his wives deceased, and those of William and Agnes, his father and mother. THE RT HON SIR ANTHONY DENNY (1501-49), Knight, was Groom of the Stool, 1518, and sworn of the Privy Council to HENRY VIII. This gentleman was the only individual, amongst the courtiers, who dared to apprise his royal master of his approaching dissolution. His Majesty had, however, such a high esteem for Sir Anthony, that he could perform that sad office with impunity; and the Monarch presented him with a magnificent pair of gloves, worked in pearls, which still remain in the possession of the family. SIR EDWARD DENNY (1547-1600), Knight Banneret, of Bishop's Stortford, was a soldier, privateer and adventurer in the reign of ELIZABETH I.
Denny was born in Cheshunt, Hertfordshire in 1547, the second surviving son of Sir Anthony Denny who was a Privy Councillor to Henry VIII and one of the Guardians of Edward VI. 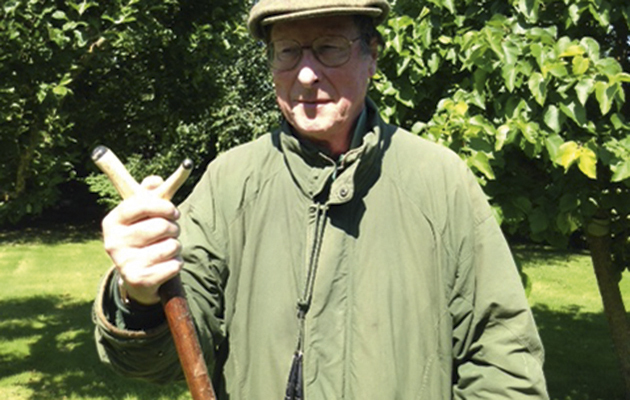 Orphaned in childhood, he inherited lands in Hertfordshire. After some minor appointments at court, in 1573 Edward Denny went to Ulster on a military expedition led by Walter Devereux, 1st Earl of Essex. Denny then took up privateering, capturing a Spanish ship in 1577 and a Flemish one in 1578. The same year saw him join a colonizing expedition led by Sir Humphrey Gilbert and Walter Raleigh; however, their ships were forced to turn for home by bad weather. Denny first became Member of Parliament for Liskeard in Cornwall for the 1584 to 1585 parliament. He was granted lands at Tralee, confiscated from the Earl of Desmond; he both became High Sheriff of Kerry and was knighted in 1588. His estates in Ireland were a financial failure and in 1591 he returned to England to command a naval expedition to the Azores. In 1593 he became MP for Westmorland and then in 1597 for the "rotten borough" of Tregony in Cornwall. He died on 12 February 1599 at the age of 52; his tomb and monument are in Waltham Abbey in Essex. SIR EDWARD DENNY, Knight (1569-1637) was summoned to parliament, in 1604, as Baron Denny; and created, in 1626, EARL OF NORWICH. The latter dignity became extinct, at his decease, without male issue; while the barony devolved upon his only daughter and heir, Honoria, wife of James, 1st Earl of Carlisle, in 1630, at the decease of whose son, James, 2nd Earl of Carlisle, in 1660, without issue, it expired. Whose heart could never yield. SIR EDWARD DENNY (1584-1619), Knight, of Tralee Castle, a military person, went to Ireland in the reign of ELIZABETH I, as an undertaker in the plantation of Munster, and settled at Tralee, County Kerry. SIR ARTHUR DENNY, Knight (1629-73), of Tralee Castle, MP for Kerry, 1661, High Sheriff of County Kerry, 1656, Vice-Admiral of Munster, 1669, who espoused firstly, the Lady Ellen Barry, daughter of David, 1st Earl of Barrymore; and secondly, Frances, daughter of Sir Richard Kyrle, Knight. BARRY DENNY (c1744-94); who was created a baronet in 1782, denominated of Castle Moyle, County Kerry. Agnes; Arabella; Letitia; Charlotte; Diana; Sophia; Jane; Penelope. SIR EDWARD DENNY, 4th Baronet (1796-1889), of Tralee Castle, High Sheriff of County Kerry, 1827, MP for Tralee, 1818-19, who died unmarried. 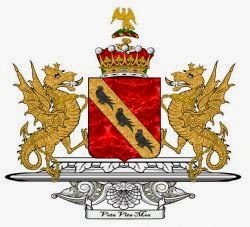 Sir Piers Anthony de Waltham Denny, 9th Baronet (b 1954). The heir presumptive is the present holder's younger brother, Thomas Francis Coningham Denny (b 1956). TRALEE CASTLE, the ancient residence of the house of DESMOND. 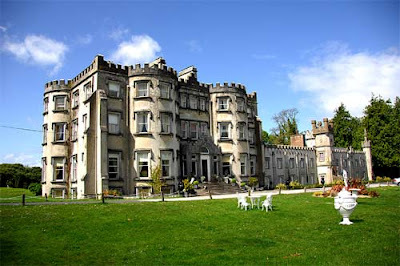 came into the possession of the Denny family as a reward to Edward Denny, the first settler in Ireland, for making prisoner the Earl of Desmond, who was accused of causing a dreadful massacre of the English at a feast to which he had invited them. Mr Denny, a military officer in the Earl of Essex's army, not only obtained the castle and possessions of Desmond for this exploit, but was created a Knight Banneret, and presented with a rich scarf, embroidered with gold and pearls, and a pair of gloves, taken off her own hands, by ELIZABETH I. IN the year 1760, or 1761, the magnificent mansion of the Earl of Arran, being sold at auction in London, the management of the sale devolved upon Mr Herbert (father of the Rector of Ledbury), his lordship's executor, and the particular friend of Sir Thomas Denny, who discovered, in making preliminary arrangements for the sale, the gloves and scarf, with an old parchment manuscript in a purple satin bag, by which, upon perusal, he was directed to the family to which they really belonged; and knowing how highly he should gratify his friend by the restoration of such inestimable relics, he purchased them for him - the gloves given to Sir Anthony Denny by HENRY VIII, for £38 17s; the gloves, given by JAMES I to Sir Anthony's son, Sir Edward Denny, for £22 1s; the mittens, presented by ELIZABETH I to Sir Edward Denny, for £25 4s. 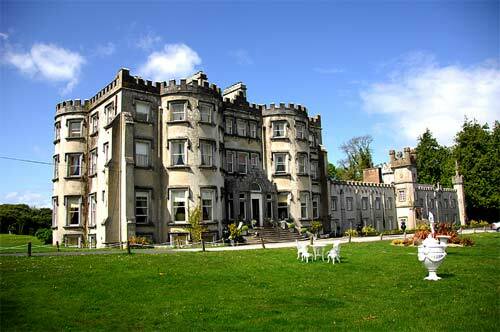 The Dennys lived at Tralee Castle from the end of the 16th century until the early 19th century. 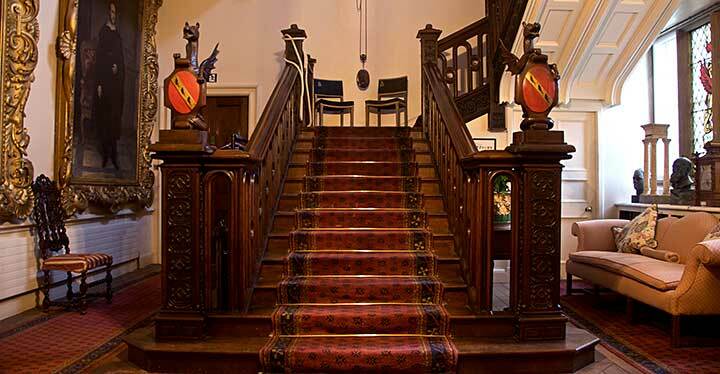 The 3rd Baronet subsequently became an absentee, living at Kingsend House, Worcestershire. He demolished the old castle. 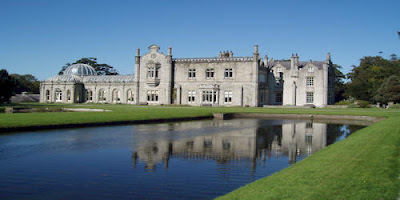 On his death in 1831, his son Sir Edward, 4th Baronet, returned to Tralee. Sir Edward rented Ballyseedy or Ballyseede Castle (above) from his cousins, the Blennerhassetts. He made plans for a new castle and spent a large sum on improving the demesne, but then joined the Plymouth Brethren and went to live modestly in London until his death in 1889. 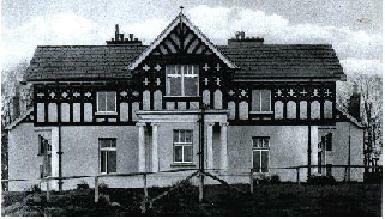 Nevertheless, the Denny estate, despite the lack of a principal house, continued to function: Tralee and its environs were densely inhabited by the baronet's siblings and cousins, including his brother, the Rev Henry Denny, at Churchill; and his brother, the Venerable Anthony Denny, Archdeacon of Ardfert, at Tralee Rectory. William Denny, the Baronet's youngest brother, ran the estate. The 4th Baronet's successor, Sir Arthur, 5th Baronet, accumulated huge gambling debts so that the whole estate was swallowed up, and by the time the Rev Sir Henry Denny, 7th Baronet, inherited the title, there was nothing left to go with it. First published in December, 2012. This family, which has been ennobled in two branches, assumed the name from the Seigneurie of LA TRANCHE, in Poitou, of which they were formerly possessed. FRÉDÉRIC DE LA TRANCHE, or TRENCH, who fled from France after the massacre of St Bartholomew, and took up his abode in Northumberland about 1575. Mr Trench thereafter crossed into Scotland, where he died in 1580. John (Very Rev), Dean of Raphoe; ancestor of BARON ASHTOWN. RICHARD TRENCH (1710-68), who was returned to parliament for County Galway, which county his father had represented for thirty-seven years. 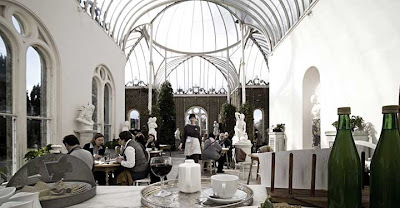 He wedded, in 1732, Frances, only daughter and heir of David Power, descended from the Barons de la Poer, and, in the female line, from the Lords Muskerry, afterwards Earls of Clancarty, by the marriage of John Power with Elena, daughter of Cormac, Lord Muskerry. Through this marriage, Mr Trench obtained the united fortunes of the families of POWER and KEATING. Anne, m C Cobbe, of Newbridge. WILLIAM POWER KEATING TRENCH (1741-1805), MP for County Galway, 1768-97, was elevated to the peerage, in 1797, by the title of Baron Kilconnel, of Garbally, County Galway, and Viscount Dunlo, of Dunlo and Ballinasloe, in the counties of Galway and Roscommon. 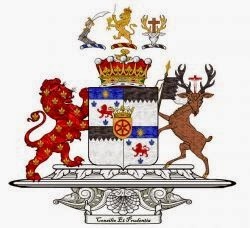 His lordship was further advanced to the dignity of an earldom, in 1803, as EARL OF CLANCARTY (2nd creation), in consequence of of his descent from Elena MacCarty, wife of John Power, daughter of Cormac Oge MacCarty, Viscount Muskerry, and sister of Donough MacCarty, Earl of Clancarty in the reign of CHARLES II. Florinda; Anne; Elizabeth; Harriet; Frances; Louisa; Emily. RICHARD LE POER, 2nd Earl (1767-1837), GCB, PC, who was created a peer of the United Kingdom, as BARON TRENCH, 1815, and raised to an English viscountcy, as VISCOUNT CLANCARTY, in 1824. In 1813, his lordship was appointed ambassador to The Hague, and was created by the King of the Netherlands, in 1818, Marquess of Heusden, having obtained permission of his own Sovereign to accept the said honour. Louisa Augusta Anne; Harriette Margaret; Emily Florinda; Lucy. Nicholas Power Richard Le Poer Trench, 9th Earl (b 1952). There is no heir to the peerages. 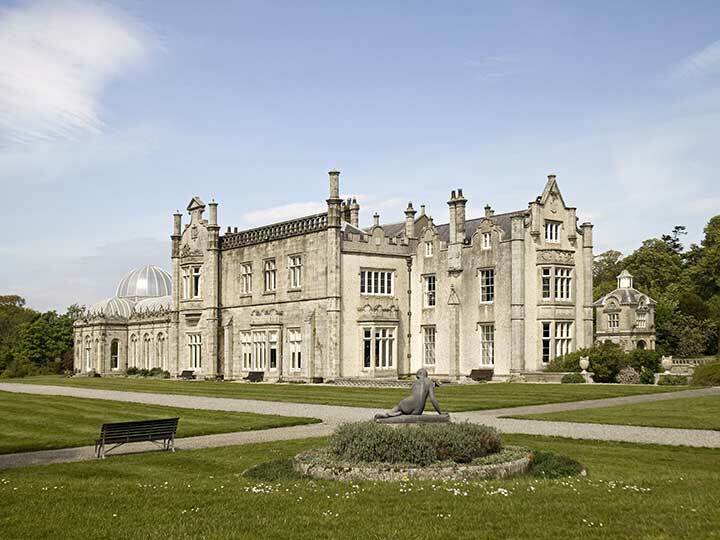 GARBALLY COURT, Ballinasloe, County Galway, is a large, austere, two-storey mansion, built in 1819 to replace an earlier house burnt in 1798. It is square, built round what was originally a central courtyard. The eleven-bay entrance front has a single-storey Doric porte-cochere. There is an adjoining front, also of eleven bays, with pediments over the ground-floor windows. The rear elevation has a single-storey curved bow. The hall boasts Ionic pilasters and niches, with an arch leading to a grand picture gallery, built in the central courtyard about 1855. 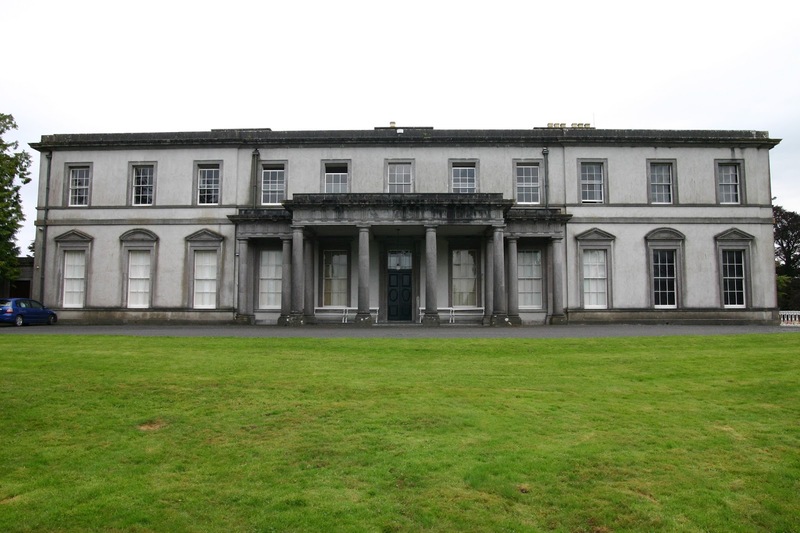 The 5th Earl of Clancarty sold Garbally Court in 1907, following the decimation of his estate caused by the Land Acts. 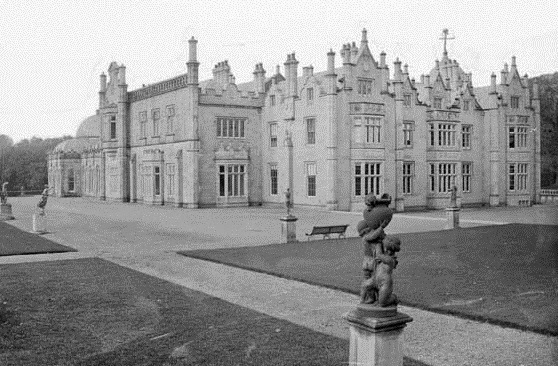 Garbally College, a Roman Catholic boys' school, purchased Garbally Court in 1922. First published in December, 2012. Clancarty arms courtesy of European Heraldry. JAMES HAMILTON (1727-1800), of Sheepshill, Abbotstown, and HolmPatrick, Deputy Protonotary of the Court of King's Bench, who married thrice. 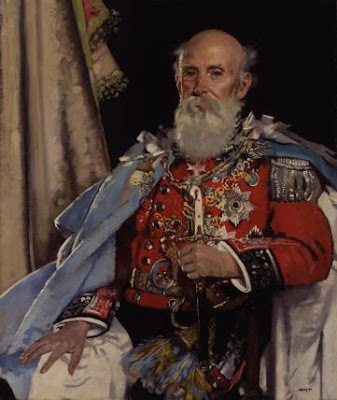 THE RT HON ION TRANT HAMILTON JP DL (1839-98), MP for County Dublin, 1863-85, Lord-Lieutenant for County Dublin, 1892-98, who was elevated to the peerage, in 1897, in the dignity of BARON HOLMPATRICK, of Holmpatrick, County Dublin. Winifred; Margaret Augusta; Georgina; Sybil Evelyn; Clare. The heir presumptive is the present holder's brother, the Hon Ion Henry James Hamilton. The 4th and present Baron lives in Cornwall. 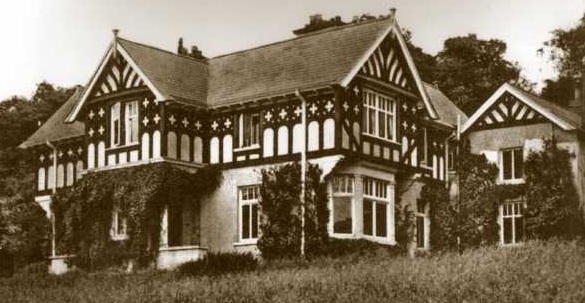 ABBOTSTOWN HOUSE, Castleknock, County Dublin, is a two-storey house, extended at various times, though mainly early to mid-19th century. It has a five-bay entrance front, the central bay breaking forward with a triple window above a projecting, pilastered porch. There is a similar side elevation, with a single-storey, pillared bow in lieu of a porch; elongated by a full-height curved bow. 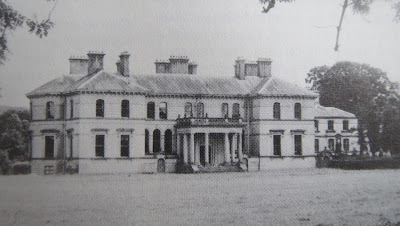 Abbotstown House remained the seat of the HolmPatricks until 1947, when the 3rd Baron lost part of his lands under a Compulsory Purchase Order to allow for the building of a Hospital. Later, Lord HolmPatrick sold remaining lands at Abbotstown to the Marine Institute of Ireland, which was located at Abbotstown House until 2005, when the house was acquired for Sports Campus Ireland. In the late 1990s, half of the lands under the ownership of the local health board were sold for development in order to finance the redevelopment of the hospital buildings. In the time of QUEEN MARY, this family, originally of the counties of Leicestershire and Lincolnshire, settled in Ireland. FRANCIS COSBIE (1510-80), the patriarch of the family in Ireland, a man famed for personal courage, as well as civil and military talents. When young he served in the wars of HENRY VIII in the Low Countries, and was not undistinguished. His abandonment of his native soil arose from the downfall of the Lord Protector, Sir Edward Seymour, 1st Duke of Somerset, whose daughter Mary, widow of Sir Henry Peyton, Knight, he had married. Deeming the disgrace and death of that once potent nobleman a sentence of exclusion from place and preferment in England, against his immediate connections at least, Cosbie (Mary Seymour, his first wife, being then dead), removed to Ireland, taking with him his second wife, Elizabeth Palmer, and the two surviving sons of the first. Here, in the land of his adoption, he soon found the opportunity of establishing a reputation, which he despaired of effecting in the land of his birth. He became an active defender of The Pale, and his vigilance, zeal, and success attracting the observation of government, he was appointed, by QUEEN MARY, 1558, General of the Kern, a post of great trust and importance in those times. In 1559 he represented the borough of Thomastown in parliament, when he was constituted, by ELIZABETH I, Sheriff of Kildare. Cosbie was granted, in 1562, the site of the suppressed abbey St Francis at Stradbally. General Cosby wedded secondly, in 1575, Elizabeth Palmer, and had issue, an only daughter, Catherine. ALEXANDER COSBY, of Stradbally Abbey, who also obtained very extensive grants of land in the Queen's County. Anne; Elizabeth; Jane; Dorcas; Isabella; Celia; Dorothy. DUDLEY ALEXANDER SYDNEY COSBY (c1730-74), 1ST BARON SYDNEY, of Leix, so created in 1768. His lordship was Minister Resident to Denmark. He wedded, in 1773, the Lady Isabella St Lawrence, daughter of Thomas, 1st Earl of Howth, but died in the ensuing month, January, 1774, without issue. THOMAS COSBY (1742-98), of Vicarstown, and afterwards of Stradbally, who wedded firstly, Frances Booker, and by her had two sons, both of whom died young. Edith Augusta Emily; Mary Powlet; Aline Islay; Lilian Alice; Violet Grace. Colonel Cosby married secondly, in 1885, Eliza, daughter of the Rev Capel Molyneux, Vicar of St Paul's, Onslow Square, and widow of Sir Charles Goring, 9th Baronet, of Highden, Sussex. Irene Mabel Alys; Dulcie Iris Voilet. Anthea Moira Enid, b 1940. Mary Siobhan Elizabeth, b 1973. 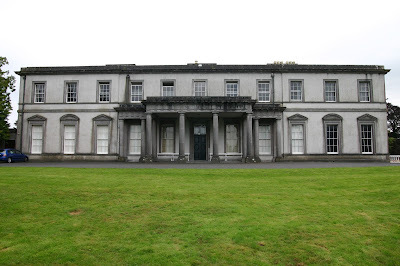 STRADBALLY HALL, County Laois, is a nine-bay, two-storey Georgian house, built in 1772. The present mansion's predecessor was erected by Lieutenant-Colonel Dudley Cosby in 1699, likely incorporating an earlier dwelling. About 1868, Ralph Ashworth Godolphin Cosby engaged Sir Charles Lanyon to enlarge and re-model the house in the Italianate style. A new entrance front was added with a large, single-storey, balustraded portico. Stradbally estate is now renowned for its Electric Picnic music festival held in the grounds. JOHN YOUNG, Burgess of Edinburgh, 1541, married Margaret Scrymgeour, the celebrated scholar, of the ancient and noble family of Scrymgoeur, and sister of Henry Scrymgeour, the celebrated scholar, professor of philosophy, and of civil law, at Geneva. 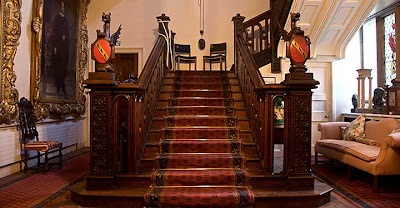 Their father was Scrymgeour of Glasswell, the descendant of an immediate branch of the Scrymgeours of Dudhope, who were created hereditary standard bearers of the kings of Scotland, in 1057, by ALEXANDER I, and became afterwards Earls of Dundee. John Young died at Dundee in 1583, aged 86; his wife died some years previously. There appears to have been a family of that name settled in Forfarshire in the 14th century. John Young had four sons and two daughters, viz. SIR PETER YOUNG (1544-1528), was born at Dundee. In 1569, he was appointed assistant tutor, with George Buchanan, to JAMES VI. He appears to have attracted the notice of WILLIAM CECIL early, as we find both him and Buchanan pensioners of ELIZABETH I. In 1598, he was appointed one of the commissioners for visiting the universities of St Andrew's, Aberdeen, and Glasgow. In 1586, he was sent ambassador to Denmark. Maria; Margaret; Frederica; Johanna; Anna. His wife died in 1595, and he wedded secondly, Dame Joanna Murray, widow of Lord Torpichen. This lady died six months after their marriage. Sir Peter espoused thirdly, about 1600, Margery Nairne, daughter of Nairne of Sandford, Fife, by which marriage he had four daughters. He wedded secondly, Jane Steward, by whom he had one daughter, ANNE. Sir James was one of the Gentlemen of the Bedchamber to the King, and had a grant of 1,000 acres of land given him in County Longford. PETER YOUNG, who was succeeded to the estate of his uncle, the Dean of Winchester. In 1620, Robert Young and his father, Peter Young, conjointly, sold the Easter Seaton Estate and other lands, and purchased part of the estates of Auldbar from Sir James Sinclair, completing the purchase in 1678. A younger son of David Young was living in Aberdeen in 1758. Nothing more is known of this branch. Alexander Young, Bishop of Edinburgh, translated to Ross, was one of the Seaton family: he died in 1644, a prelate of distinguished learning and piety. John Young, also of this family, was elected Bishop of Argyll in 1661, but died before he was consecrated. Of Sir Peter Young's younger sons, the third, Peter, was attached to the train of Lord Spencer; sent on a special mission, in 1628, to invest Gustavus Adolphus with the Order of the Garter, and was knighted by that monarch, who also granted him permission to quarter the arms of Sweden with his own proper arms. He was gentleman usher to CHARLES I, and died unmarried in 1661. Patrick, the fifth son, was Librarian to JAMES I and CHARLES I, Rector of Hayes, Middlesex, and Lannerage, Denbighshire, and prebendary and treasurer of St Paul's. John Young (1585-1654), the sixth son, after completing his education, entered the Church, and was afterwards Dean of Winchester. THE REV JOHN YOUNG, Rector of Urney, County Tyrone, a clergyman of the established church. His mother, Isabella, was a sister of Sir Peter Young, of Easter Seaton, who married a kinsman and namesake. In the reign of JAMES I, this Rev John Young wedded, in Scotland, Elspa Douglas, and went to Ulster, where they settled. After some time, he obtained church preferment, and also considerable landed property, through the lady's father, by an exchange of lands in the counties of Donegal and Londonderry with Lord Abercorn, for an equivalent in Scotland, as a settlement on his daughter and her family. Part of these lands were in the possession of Richard Young, of Coolkeeragh, near Eglinton, their lineal descendant. The Rev John Young had a numerous family. JAMES YOUNG, resided in County Donegal, where he married and had several children, of whom nine were sons. Being a man of good fortune, much attached to the protestant cause, he was not only an active partisan at the siege of Londonderry, but was enabled frequently to send aid to the besieged during their arduous struggle. He was, in consequence, one of the citizens of Londonderry attainted by JAMES II. JOHN YOUNG, of Coolkeeragh, the great-grandson of this James Young, wedded Catherine Knox, granddaughter of the Rt Rev Andrew Knox, the second Lord Bishop of Raphoe after the Reformation, who died in that see in 1633. Susanna Maria; Rebecca; Anketell; Catherine. Mr Young, a director in the East India Company, was created a baronet in 1821, denominated of Bailieborough, County Cavan. THE RT HON SIR JOHN YOUNG, 2nd Baronet, GCB, GCMG (1807-76), Governor-General of Canada, Governor of New South Wales, Chief Secretary for Ireland; was elevated to the peerage, in 1870, in the dignity of BARON LISGAR, of Lisgar and Bailieborough, County Cavan. He espoused, in 1835, Adelaide Annabella, daughter of Edward Tuite Dalton, of Fermor, County Meath, daughter of the 2nd Marchioness of Headfort, by her first husband, Edward Tuite Dalton. His lordship died in 1876, when the peerage became extinct, though he was succeeded in the baronetcy by his nephew, William Muston Need Young (1847-1934), an official in the Indian telegraph department. 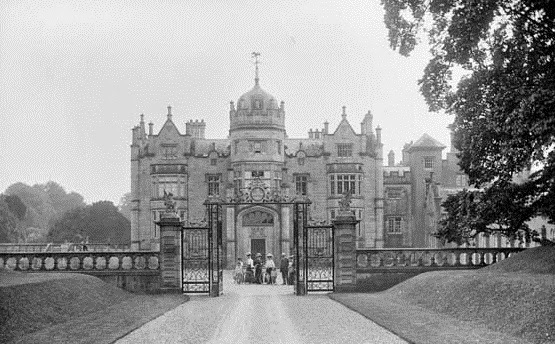 Lady Lisgar subsequently married her late husband’s former private secretary, Sir Francis Charles Fortescue Turville KCMG, of Bosworth Hall, Leicestershire. BAILIEBOROUGH CASTLE, Bailieborough, County Cavan, was an irregular two-storey Victorian house with a gabled, buttressed Gothic porch. About 1895, most of the estate was sold off under the Ashboune Act; while the house was sold to Sir Stanley Herbert Cochrane Bt. In 1918, the house was completely destroyed by fire. 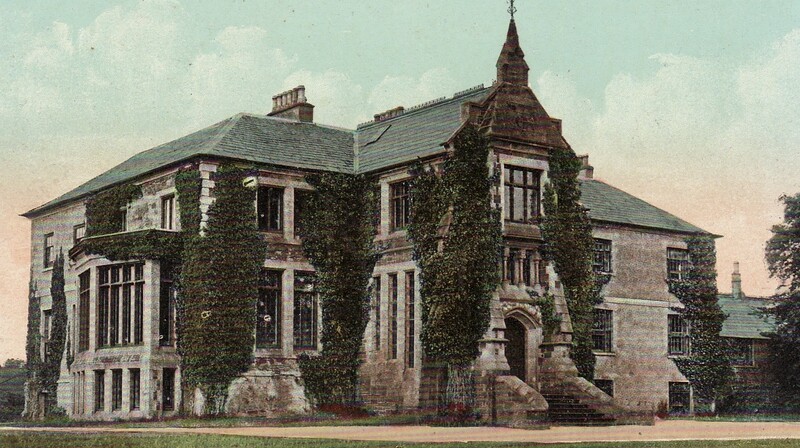 It was partially rebuilt by the Marist Brothers in 1920, though sold for demolition in 1923. One of Sir Max Hastings' favourite pieces of kit happens to be his treasured thumbstick, and I can now proudly say that I am the owner of one myself. A pal and follower of the blog, Stephen, most generously offered to make me a thumbstick several months ago, following my tweet about Sir Max's walking-stick. Accordingly, I decided to mark the occasion with dinner at Deane's Love Fish restaurant in Howard Street, Belfast, last night. Coincidentally it also happened to be the ninth anniversary of my blog. I arrived slightly early, so I was shown to the champagne bar (which happens to be adjacent to Deane's Eipic, recently awarded one Michelin Star. I had time for a few refreshers, viz. a Tanqueray Ten, Shortcross, and a Swedish number called Hernö (I think). When Stephen arrived he gave me my handsome new thumbstick, made mainly of chestnut wood and antler. It also has a distinctive, engraved, sterling silver collar. I can only imagine the amount of time that Stephen spent on such a beautiful item; such craftsmanship. At length we were shown to our table at Love Fish, where I had the Crevettes, Garlic butter and Sourdough starter. I enjoyed it: Juicy, large prawns; rich butter; and a thin slice of bread. Michael Deane was there in person last night, too. I had Seafood Pie for my main course; while Stephen had the Galloper's Beer-battered Haddock, Mushy Peas, Tartare Sauce, and Chips. The ambiance at Deane's is cheerful and jolly, and the staff are all very attentive and eager to please. In fact Michael Deane was there himself last night.